The Goal Seek feature in Excel 2010 is a what-if analysis tool that enables you to find the input values needed to achieve a goal or objective. To use Goal Seek, you select the cell containing the formula that will return the result you’re seeking and then indicate the target value you want the formula to return and the location of the input value that Excel can change to reach the target. 1Select the cell containing the formula that will return the result you're seeking; in this example, cell C7. This cell contains the formula that calculates the forecast for the first quarter of 2011. 2On the Data tab, choose What-If Analysis→Goal Seek in the Data Tools group. This action opens the Goal Seek dialog box. Because cell C7 is the active cell when you open this dialog box, the Set Cell text box already contains the cell reference C7. 3Select the To Value text box and enter the goal. This is the value you want the formula in the Set Cell box to reach. In this example, it’s 300000. 4Select the By Changing Cell text box and select the cell that you want to change. Excel will change the value in this cell reference to try to reach the goal in the To Value box. In this example, cell C3 contains the first quarter sales. The absolute cell address, $C$3, appears in the text box. 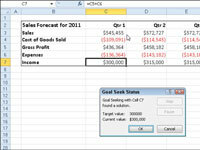 Excel displays the Goal Seek Status dialog box along with the results. In this example, Excel increases the sales in cell C3 from $250,000 to $545,455, which, in turn, returns $300,000 as the income in cell C7. 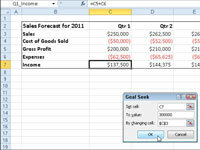 6If you want to keep the values entered in the worksheet as a result of goal seeking, click OK. If you want to return to the original values, click the Cancel button instead. Notice that because all of the values in this table are formulas that ultimately are derived from the value in cell C3, all of the values changed when that cell value was updated during the Goal Seek process.